Right, it’s time to start looking ahead to Sunday’s National Football League final against Kerry at Croke Park. Our Division One decider forms part of a triple-header at HQ that day, with the National League camogie Division One final between Kilkenny and Galway starting at midday, the National Hurling League final between Limerick and Waterford getting underway at 2pm and our final throwing in at 4pm. It was announced yesterday that Longford’s Fergal Kelly is the ref for our match. I can’t remember if he’s ever reffed a match involving us before – I certainly don’t recall any of our matches where he was in charge – and Sunday’s final is the first high-profile fixture he’s been entrusted with. Best of luck to him. The photo shoot for the final also took place at Croke Park yesterday, where we were represented by Chris Barrett, while they fielded Paul Murphy for it. Arising from this, there are pieces with Chrissy in a few places today. Take your pick: Irish Examiner, Irish Times, Irish Independent, Irish Mirror, Herald. It’s all interesting stuff, including his views on the impact of working with a geographically split squad (not as relevant a factor as many claim), why we bombed so badly against Dublin a few weeks back (a complete anomaly), how we’ve managed to make it to the final this year (the head-start in training) and the clear trend among the older guys towards settling down and getting married (once one drops, the other drops). He also rates the competition for places within the panel right now as fierce, saying that “it’s the most competitive squad I’ve been involved in with Mayo.” He laughs off the notion that the county are on the rise again, saying that it’s not as if “we’ve risen from the dead.” Just Newbridge. Another piece worth reading today is one by Colm Keys in today’s Irish Independent (here – requires registration), in which he assesses our League campaign to date and considers the importance of claiming the title on Sunday. Tickets won’t, of course, be a problem for Sunday. If you’re a season ticket holder you’ll have already got the usual mail from them about taking up the Bring a Friend option (which needs to be exercised before midnight tonight). Tickets (€30 for adults, €5 for juveniles) are also available online and via Centra and SuperValu outlets. So Chris , are Mayo Back ? Best of luck to Mayo on Sunday, sport can be very funny sometimes, At half time on Sunday I was looking at hopefully a trip to Croker for a Galway double header but that didn’t last long with both our teams collapsing.. I see Chris has reverted back to the 2017/2018 jersey for the photoshoot! Kerry will be well up for this, they were disgusted at losing to us 2 years ago in the semi…they may say nice things about us but they don’t rate us as footballers…never have. Any chance of Cillian making an appearance? I don’t think it would be fair for Cillian to make an appearance even if he was fit. Some fringe forward would miss out on togging in Croker for a National final in order for Cillian to be in the 26. Word from Chris Barrett was Cillian was likely to play some club league games in April. There’s no way on earth I’d pitch Cillian into a league final at this stage. He’s recouperating from surgery and in my view this is not the time to pitch him back into competitive action. You would imagine the pace of the game (final with trophy on the line) will simply be too frenetic for him at this stage of his training. You’re actually risking him getting another injury. I would prefer that we excercise caution and ease him back into the fray. Senseless taking risks at this stage of the season. Reckon you should come back from Switzerland for this one. Take a day off if you can. Spot on yew tree, Kerry don’t rate us at all. Match ups will be important. Harry on Clifford and Barrett on o’shea, coen will probably mark walsh again. Barrett is probably not tall enough or long enough in the arms to be tackling Sean O’Shea. Tall players can shield the ball very effectively from shorter players, making it near impossible to tackle the ball. Paddy Durcan who is taller than Barrett struggled on Sean O’Shea last year it was a physical mismatch. Personally I would go Brendan Harrison on David Clifford and Stephen Coen on Sean O’Shea. Just for the reasoning that Stephen Coen would be improved by being offered such a challenge. He has lined up this year on Peter Harte, Tommy Walsh and Jack McCarron. Yes it has been a mixed bag, but in terms of player development he will only reach higher levels being stretched to an uncomfortable level by top quality and physical forwards. Probably ideal is Donal Vaughan on Sean O’Shea with an attempt to get Sean O’Shea going the other direction but we already know Donal Vaughan is a Croke Park big day player. This league has been super so far in getting more players like Stephen Coen and Matthew Ruane closer to that big match Croker level. I dont give a s*#t if Kerry rate us or not, fact is we’re technically unbeaten in 2 championship games against them. We’re not the push overs we were in the mid noughties. A week ago I thought the league final would be a bad idea, pressure an a target on the winners I thought. Now ive done a complete 180 and hope we go all out to win it. Feck it, there’s a trophy for the taking in the hogan stand, hope we absolutely go balls out for it. Kerry will be gunning for this title, no matter what the yerra mafia say!. Would love to get one over on them again in Croker. TH, thats the team I’d start alrite, D Coen deserves a run out in croker, Reape played again the dubs, so now it’s Darrens turn. Hope he’s selected along with Keegan. For as long as I can remember on the blog our depth of panel has always been an issue. We could field a strong 15 but when it came to the 55th/60th minute of big games and the game was in the melting pot we lacked the 2 or 3 players that could come into the game with fresh legs and drive on. Im really hoping Sunday will see a change in that. Should play this in Tralee. I’ll be honest here and say that this is a very difficult game to call. Firstly both teams need a win as for the most part the field will be populated with an unusually high number of starters and will hey will be very hungry for their first (or for a few starters their second) medal. The medal is not the issue here as a victory for either team will give them a great boost going forward into the Championship, both teams have many players who are still giddily prancing on fresh spring grass. The real issue here is the perception of or indeed the collective belief of who can tip the scales when it really counts. With so many young players on both sides this game has a significantly different weight too it. Mayo are the more experienced and have the strength and conditioning to control the game if they can exert control in key areas. On the 16th Ruane and O Shea brought both bulk and silk to the engine room and ye bossed this zone as a result. The intensity of your forward tackling gave both of them room to both create cover and stifle singular forays into the Mayo defensive backline. The Kerry midfield players were given a lesson and I hope they learnt well from this bruising experience. Horan has a welcome headache now of trying to select a team that will show confidence in the younger players while sharpening the appetite of the older warriors. He knows that in the coming campaign he will need to tap the wells of both youth and experience to navigate the tricky waters of winning games and keeping the collective both united and driven. Some of the names on the bench and those sitting on their hands in the stands recently is sunlight in a shadowed area as far as mayo is concerned. Horan is clearly creating a very hungry panel and I’d say the A v B games will not be an envoirnment for those that blush easily not to mention what it will be like for those fighting for a jersey on the field. This can only be good for Mayo football going forward and as far as I am concerned throws a total spanner in the works when it comes to calling a winner in this one. My strong hope is they either bypass midfield and feed the inside line with very fast ball and trust them to knock the wind out of the Mayo sails or else to really man up in the centre and hope to gain parity there but it looks like a difficult ask with Ruane and O Shea in the form they are in. This could be a real cracker of a game and I can’t wait for it, saying that it is the league and it’s not the life or death of Championship but with the ingredients of the recent past it will feel like a game in August all be it with a safety net of a non season ending game. Regina for the first time in a long time I think we are cover with subs, we will struggle to name who will make the match day 26. I came up with 33 players that played in the league maybe its 34 if Seamus o Shea came on in one game, 15 of those were forwards and we still have Cillian, Cian Hanley and Ryan o Donoghue out injured. One thing I like most when I look at the list is variety. Someone once said different horses for different courses, same can be said for our top opponents and what’s needed during the course of a game or freak injuries. I remember an All Ireland final when all our midfielders where off the pitch and we had none to bring on. My one fault with Rochford was with his bench, similar types of players and rarely used. When I look at this list I see Coen/Reape/Diskin and now Carr big Target men who can take a score, then we have the runners like Boland James Durcan who when the game gets stretched are ideal players to bring on. I think James Horan has his work cut out for him when cutting his panel. The ball winners in the inside line for me is a big difference. We’re forgetting a little bit just how weak we were in terms of having big physical forwards who could win their own ball. Brian Reape, Darren Coen and James Carr are getting up to speed with the level. Those three I think are our most important fringe players as they can add power to our attack. I’m not sure I class Matthew Ruane or Michael Plunkett as fringe now as they both were two of our better league performers. I see them already as two core players for us over the next four years. I see that Evan Regan was back playing for Ballina last weekend, believe Horan is releasing players back to their clubs to get game time if not involved in match days. Like to see abut more of Carr as he has that burst of speed that goes with well with his size and frame. Coen and Reape brings that physicality into the full forward line they are well able to take a hit, win their own ball and hold it up for others. Like Coens vision as well. His foot pass in the first half against Galway comes to mind. Best of luck to a rejuvenated Mayo team in Croke Park on Sunday. And also to St Colmans in their All Ireland semi final Saturday. 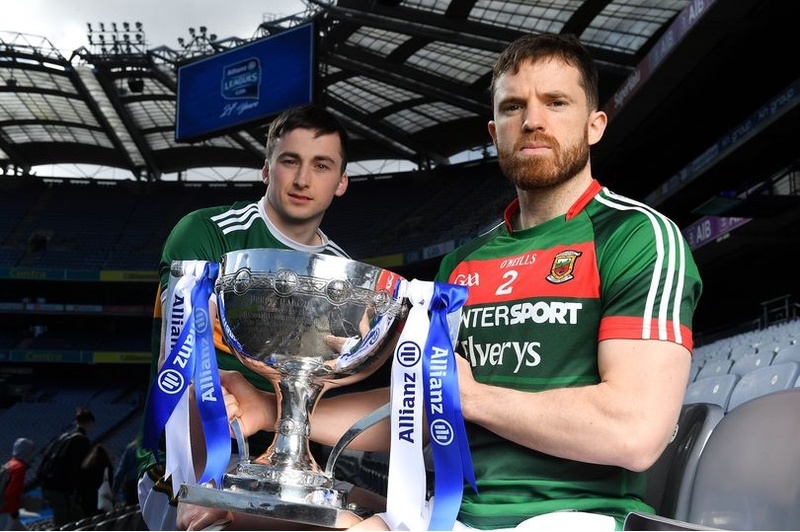 Seems to me there could be a lot at stake in this game for Mayo, quite apart from the chance to claim a national title that will forever be recorded in the history books. What if Mayo lose it and have to deal with the burden of yet another big stage, final failure? What damage would a second failure in Croke Park in 2019 mean when it comes to Super 8s time? What if Mayo win it and suddenly become favourites for Connacht and probably 2nd or 3rd favourites for the AI? Would anyone prefer if Mayo had NOT qualified for the final? I see we’ve got a Dub in here trying to sow seeds of doubt. There is a league title at stake on Sunday, nothing more. We’ve been listening to commentators harp on about psychological burdens and whatnot for years. It was boring then and it’s boring now. Get to as many finals and win as many possible should be our attitude. To answer your question, would anyone prefer if we didn’t get to a league final… yes – Dublin and Galway! If Mayo and their supporters consider themselves a serious top GAA county then they can’t be afraid of finals in case they lose them. It’s total rubbish to think we would be better off not getting to the final. Mayo and supporters need to be able to handle finals with confidence and able to handle the added pressure of what being in finals brings. If we are not prepared to for these days then we should just give up now. If the fear of failure is greater than the desire to win, then don’t get involved in competitive sports. Not wanting to get to a final because you are afraid of losing it, is a losers mindset. End of story. Ever hear of the phrase “quitters never win and winners never quit”? Well, there’s truth in it. The reason we didn’t win an All Ireland in ’16 and ,17 is because we didn’t get the rub of the green with some terrible refereeing decisions AND we were playing an outstanding (said through gritted teeth) Dublin team. We didn’t lose them because we were afraid of winning them. The reason we didn’t win the All Ireland in ’13 is because our sideline made terrible decisions that day. The reason we didn’t win an All Ireland in ’12 is because we were playing the best team in the country over that 2 year period, a team that had developed a groundbreaking style of play that meant once they got ahead of you on the scoreboard, it was game over. That Donegal team, in time, will be written about as the one that brought super-human levels of fitness, stamina and tactical discipline to the game. We didn’t lose those finals because we were afraid to win. This time last year they all said we were gone. RTE made tearful montages when we lost in Newbridge, so-called “experts” wrote our epitaphs in the national newspapers. It was all bollox. Anyone who traveled the length and width of the country with this team, anyone who really knows this team and knows the talent and desire we have coming through our underage structures will know we were never gone. We were just drawing our breath. As long as we don’t quit, we will win. Sooner or later. @Backdoor Sam, Who was the Dublin manager who said in relation to Dublin’s failure in the Championship (Fádo Fádo) that ‘You could only dance with the girls in the dancehall , when talking about the apparent lack of football talent in the Capital??…. I think it was Mayo born Tommy Lyons!.. I genuinely know a man, his dancehall day’s are from a bygone era ( He’s still alive and supports Mayo, on fine day’s) He eventually got round to chatting up (Squared her, as he put it) the Cáilin of his dream’s at a dance, he found out all about her, a fine good looking girl, immaculate manner’s, went to Mass every Sunday, a member of Legion of Mary, didn’t drink or smoke, not the type who would lead a man astray. Couldn’t possibly find better, but there was a one serious snag, he found out where she lived…. He would have to walk past a Haunted House, when walking her home, that wouldn’t be too bad he could handle that, when she’d be holding his hand, and as this was the type of girl who wouldn’t be causing the would be Romeo any long noctorional delays, he would have to walk back past the haunted house all on his own… So he had no more to do with her, worse still he still thinks that was a good idea …He also believes in the “Curse” . Who’s afraid of Final’s? I don’t think it’s this Mayo Team, or their many thousands of supporter’s! Great piece Pebblesmeller, we as a people and as a county will never quit. Make no doubt about it, we will win on Sunday. Loreto Road, you got a nice couple of digs in with that post. I think your trying to blow it up into sonething its not. Its a pre-season competition, that doesnt even have a quarter of the value of a provincial final. The vast majority of Mayo supporters understand this. Our objectives for this league have been accomplished. Whatever the result is Sunday, it wont change the fact this has been our best league perfornance since ‘12 or ‘13. Credit to JH for that. This game is just a bonus preperatiob match for the Connacht championship, where we’ll be on the real big stage against Roscommon then hopefully Galway. @ Leantimes Tommy Lyons might well have used that phrase but I believe it was first made famous by Mick Burke the manager of the 1985 All Ireland winning Mayo minor team. After the match Mick was asked by a reporter how did he manage to win the All Ireland with what was considered an average Mayo vintage of players he replied with the now famous ” you can only dance with the girls that are in the dance hall”!! @Crete Boom, could very well have been Mick Burke who made it famous… But any minor Team with, a lethal Goal scoring ability and assassin’s eye, of one Micheal John Mullins, was in with a great chance! @On that day in 1985, when Mick Burke was pinning unforgettable quote’s, and Michael John was shooting the lights out, even managed one of his two goals was scored without his football boot on… both Mayo and Kerry won, and both danced with the prettiest girls in the dancehall…. Next Sunday, only one of us will get to dance! I don’t think it matters if we lose but we won’t lose. As long as it’s a good high performance and good flowing football game I’ll be happy. Leantimes all those sayings are bullsh1t anyway And soundbytes and cliches like you might hear off English soccer managers the reality of it is half of us would never have got married if it wasn’t for alcohol even if there was a million girls in the hall . And maybe vice vers for the ladies who am I to judge. I firmly believe the more finals we keep getting to the better. Realistically we have a great chance of winning on Sunday ok Kerry are good and they have some excellent forwards but sure we have a good defence and good midfield. Never be afraid to get to finals or to win or try new or different things none of us are getting out alive so might as well give it your best shot. I have really enjoyed reading the comments above and I love the attitude of all the Mayo people who say ‘let’s give this one a go’. It’s not the end of the world if we win or lose, as long as we play really really well! That’s all that matters. I wouldn’t say no to a win though. At this stage, I think we have gotten through the fear or discomfort of losing. We know all about it. We’ve looked at it in the face – like Dorothy in the Wizard of Oz, who comes face to face with the Wizard at the end and finds he wasn’t that all powerful person after all – and let’s keep on improving. I’m proud of the attitude shown above. Moreover, I agree with the poster above who said that it is the Roscommon game where there is really something at stake. This League final is a great opportunity for us – another game, young and older players getting a run out in Croke Park, really having to roll up the sleeves and get stuck in against a top side. And a bit of excitement and a fab day out for us supporters. It’s such a tonic to get rid of the cobwebs of Newbridge and our bit of a trek though the wilderness last year. How exciting for us all! @Backdoorsam, True for you.. but the girl I was alluding to, neither drank nor smoked, an only daughter with 40 acre’s of good land and a job in the Civil Service, and the Brave Boyo (would be Romeo) was a pioneer!.. If only he wasn’t afraid of that Haunted House, so in this particular instance alcohol has nothing to do with it…. Your dead right about that rubbish malarkey cliches often trotted out by English soccer Manager’s, like Brian Cloughs ‘Its a funny old game’ and Bill Shankley ‘Football isn’t a matter of Life and Death, it’s much more important than that’ … We the Mayo supporter’s don’t buy into that auld rubbish….We will be on the road ‘bright and early’ next Sunday, as the fellow says ‘ the early bird gets the early worm’ not great if you happen to be an early worm (Sín Scéal Eíle) determined to bring home the Silverware, and only then will we think about a dance…. to misquote one the greatest Sport’s commentators of all time… Bill McClaren ..’They will be dancing on the streets of Castlebar’tonight’! Anyone who needs a ticket for the game Sunday can get a ticket of any gaa season ticket holder in Ireland free of charge!! You are right again Backdoorsam about the ghosts in Croke Park… last time I was there, I could have sworn that I heard someone go ‘Boo, Boo’!..as for the girl who lived the far side of the Haunted House…. she started out as a T total, Civil Servant, went on the bottle, ended up a Government Minister, and wasn’t very civil to her Servants either, .. that poor guy had a lucky escape! Trying not to break rules here WJ, (delete if necessary) but I see the predictable stupid rumours are circulating about a certain player who wasnt involved last sunday. Some people have nothing better for doing!!. A great part of the national interest in the Mayo saga stems from that story being such a prolonged and dramatic tale of joy & agony, strength & weakness, expectation & disappointment and its hard not to frame every game as another chapter in that saga. So forgive me for indulging in that – I appreciate many Mayo folk would much prefer attention to focus more on logic and reason rather than engage with the national audience’s interest in a multi-generational tale of romance. That said, I’d expect JH will approach the game as neither a free-pass bonus nor a must-win, be-all/end-all. Its another step along the road while also being an excellent opportunity to have this forming team test itself in HQ against top opposition. So I agree with those who say that a performance is more important than the result. Of course nobody would refuse a 10-point hammering of the Kingdom (I’d even cheer that) but assuming the game is competitive and the performance is strong, then a result that sees Mayo a few points ahead or a few points behind at the final whistle would surely be equally satisfactory. I don’t see any sign of any rumours circulating here, Mayo Dunphy, though please correct me if I’m wrong. I’m on high alert on that front at the minute, though, for reasons it wouldn’t be right to expand on here. I don’t like the sound of this! Even though I have no clue what the sound is.